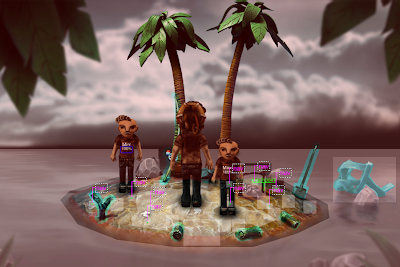 The Dream Machine is a point'n'click adventure game made out of clay and cardboard. This blog chronicles the production of the game. This is a sneak peak behind the curtains of the game engine. It's basically how we set up every environment of the game. If the view looks unfamiliar it's because most of these objects are normally hidden from your view, but they affect the way Victor navigates and interacts in every scene regardless. This – the very first thing you encounter – is unsurprisingly the one scene we've spent most hours tweaking. It's the point of contact for most players and therefore establishes the tone and the interaction rules for the rest of the game. • It establishes the dream theme that will become more important later in the game. • We always wanted to start the game off in a self-contained area so the player could learn the basics before we started to layer in story and exploration. • We also wanted to give the player a chance to sample the flavour of our puzzles before ramping up the difficulty. • The most important purpose, though, is to give the player a sense of who they're going to play for the rest of the game. If you examine everything or try to combine everything with everything else, Victor's personality starts shining through. On a not very related note, we're participating in the Steam Indie Game Sale. If you're still on the fence or want to purchase the game as a gift for a friend/loved one/respected compatriot/inferior collaborator/dull employee/about-to-be-dumped partner/distant yet strangely compelling relative/bribeable governmental official – now is the time! It was really interesting to learn about such things, especially about what is left behind the scene. Sometimes I think that game developers should pay more attention to planning in order to avoid some mistakes. This is great . Thank you very much , i love such good things that are specially very good for the steam games. The principal crew behind The Dream Machine consists of Erik Zaring and Anders Gustafsson. Our company is called Cockroach Inc.